On 3 March 2010, Mars Express performs its closest flyby ever of Mars' innermost moon Phobos. 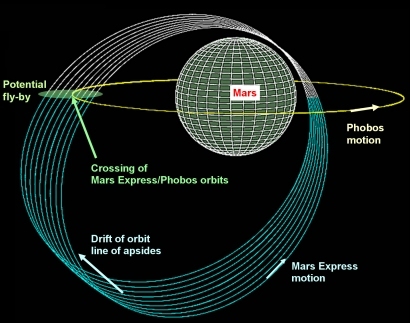 This diagram shows the orbits of Phobos and Mars Express around Mars, with the point where the orbits cross indicated at top left. The orbit of Phobos lies virtually in Mars' equatorial plane and is indicated in yellow. Mars Express is in a polar orbit. Several revolutions are depicted here, with the colour indicating the parts that are over the northern hemisphere (white) and the southern hemisphere (blue) of Mars. Because the orbit of Mars Express evolves, with the line of apsides drifting, sequential revolutions do not overlap.